Inhaled mometasone was shown to improve pain scores and decrease soluble vascular cell adhesion molecule (sVCAM) concentration in a randomized controlled trial of nonasthmatic patients with sickle cell disease. We sought to explore potential changes in systemic inflammation as a mechanism underlying this effect. Serum samples from 41 trial participants (15 placebo- and 26 mometasone-treated) were analyzed using a 92 inflammatory marker panel at baseline and after 8 weeks of mometasone therapy. Individual marker analysis and correlation analysis were conducted. Adjusted for age, the mometasone-treated group decreased the concentration of CXCL9, CXCL11, CD40, IL-10, and IL-18 relative to placebo-treated participants. Hierarchical clustering and correlation analysis identified additional evidence for a decrease in cytokines linking to macrophage signaling and migration. There was no statistically significant change in markers of asthma and allergy, indicating that the improvement was unlikely mediated by modulation of occult reactive airway disease. 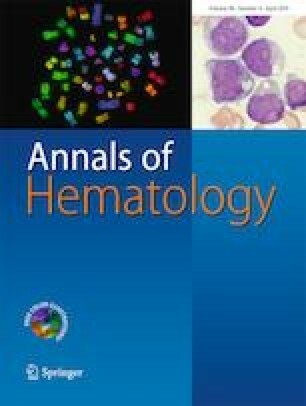 This analysis of inflammatory markers suggests that decrease in macrophage activity may be involved in the mediation of the clinical benefit seen with use of inhaled mometasone in nonasthmatic patients with sickle cell disease. Trial registration: clinicaltrials.gov identifier: NCT02061202. The online version of this article ( https://doi.org/10.1007/s00277-019-03635-9) contains supplementary material, which is available to authorized users. The authors would like to thank Jason Connor and Wil Meurer for Bayesian statistical support and Alexa Punzalan for trial oversight and execution. This study was funded by the National Heart, Lung and Blood Institute (IND #117997). All procedures performed in this study were in accordance with the ethical standards of the institutional review board and with the 1964 Helsinki declaration and its later amendments or comparable ethical standards.